Boyd had joined the 25th Fighter Interceptor Squadron in January 1953, only months before the war ended in July. During that period the 26-year-old took part in 22 combat missions in the Sabre F-86 fighter aircraft. A highly skilled pilot, he was able to easily outfox the pilots of the Russian-built MiG-15 fighters by executing a series of rapid maneuvers. Boyd’s speciality was the ‘High G Roll’, described as a “rolling defensive maneuver designed to force an overshoot upon an attacker with a low rate of closure.” The idea was simply to change places from being a target for an attacking aircraft to being in the reverse situation. These wins were in spite of the fact that the MiG-15 was superior to the F-86 from being lighter and using a jet engine with more thrust giving it a greater rate of climb and a higher ceiling than the F-86. And yet, the official count for the war was 792 MiGs shot down and 78 F-86s shot down–an amazing 10 to 1 kill ratio. Among the obvious advantages for the US Air Force were the better trained pilots, particularly against the poorly-trained North Koreans in the later stages of the war. But was this the only reason for the one-sided result? Boyd would be the one to find out and, in so doing, change the world of aviation forever. Although it was only for a brief period, Boyd’s combat experience in Korea was the foundation for a life devoted to the study of warfighting and it’s application to living and surviving in a complex, ever-changing world. The Great Depression of the 1930s was disastrous for the region and full employment and prosperity only returned when World War II required ships, munitions and uniforms. The Boyd’s were indeed poor and John was ridiculed by some teachers and students for his hand-me-down clothing. His mother told him none of this mattered. Again and again she stressed that if he worked hard and had integrity that one day he would rise above those who snickered at his poverty, ridiculed his clothes, and thought they were superior to him. He took his mother’s message to heart. He worked hard at everything he did. He had something to prove. He became a champion swimmer because he worked at it. He was good at math because he could concentrate. Like many boys, he was infatuated with flying and in his last year at high school he enlisted in the Army Air Corps. This was in late-1944 and the war effort was at its peak in Europe and in the Pacific. For the next two years he served with the Army Air Corp, spending time with the U.S. Army occupying forces in Japan. After he was discharged early in 1947 he took advantage of the GI Bill to study at the University of Iowa, graduating with an economics degree in 1950. He would later marry Mary Bruce, a fellow student he had met while at university. The U.S. Air Force was formally established as a separate force from the U.S. Army in 1947. On July 8, 1951 Boyd was accepted by the Air Force to train as a pilot in the T-6 Texan single-engine World War II training aircraft. He would remain in the service until he retired from active duty in 1975. His initial training was followed by conversion to the F-80 Shooting Star jet fighter and by the end of 1952 to the F-86 Sabre. Only the very best pilots were selected for these advanced training programs. It was a dangerous occupation; some seventy trainee pilots died the year Boyd was learning how to fly jets in air-to-air combat. Boyd was now ready for his assignment in Korea and couldn’t wait to get into the action. After hostilities finished in Korea, Boyd’s squadron was kept on recognisance missions. This gave the pilots the chance to practise simulated air-to-air combat and gave Boyd the opportunity to explore new combat tactics. He was by far the most dedicated and skilled pilot in the squadron and was happy to pass on his knowledge to other pilots. 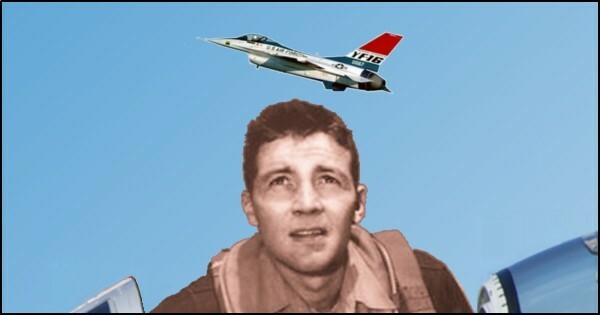 Boyd’s performance in Korea led to him being promoted to Captain in 1954 and be posted to the elite Fighter Weapons School at Nellis Air Force Base in Nevada, initially as a student and then as an instructor. It was during this time that he developed and wrote his Aerial Attack Study, which codified all known air combat tactics. This was done in his own time. The 1960 version was classified but the 147-page 1964 edition became the bible of air combat tactics throughout the world. His outstanding contribution would have been sufficient for Boyd to be remembered as a master of his profession but it was only the start of things to come. His time at the Fighter Weapons School gave him a chance to think back about his time in Korea and conclude there were two critical features of the F-86 aircraft that led to their air-to-air combat success. The first was the larger canopy which gave the pilot a better view of the situation. The other factor was the hydraulic control of flight surfaces which gave the U.S. pilot the ability to make faster transitions. He concluded there were two ways to beat someone in aerial combat: speed up your decision-making or slow down theirs. He would continue to build on these insights in the years to come. Boyd recognised he needed an engineering degree if he was to go further in his analysis of aircraft performance. His application was refused at first. Then it became clear that the Air Force was falling behind in fighter aircraft development and suddenly there was a need for personnel with engineering qualifications. In September 1960 Boyd began classes at the Georgia Institute of Technology. It was during his second year there that he came to the realisation that it was the ability for an aircraft to change its energy states that led to maneurability and vice versa. After he graduated in Industrial Engineering he was promoted to Major and continued to work on his theory while stationed at Eglin Air Force Base in Florida. His project was unauthorised but he found a partner, Thomas Christie, who worked with Boyd after hours in developing the theory. It was mid-1963 when Boyd was ready to release his findings through a series of briefings followed by the release of the Energy Maneuverability Report in May 1964. The basic principles behind the E-M Theory were simple and elegant. What took time was getting the needed data for all U.S. and foreign fighter aircraft and running this data through computer programs. For his work on E-M Theory, Boyd was recognised by the highest levels of the Air Force for his contribution to aircraft performance analysis and its application for future aircraft design. He was awarded the Air Force Systems Command Scientific Achievement Award and Air Force Research and Development Award for Aeronautical Engineering, the highest awards that can be bestowed on an individual. However for many other stake holders in the Air Force, the E-M Theory was an embarrassment because it showed they had “stuffed up.” Many attempts were made to discredit the theory and Boyd personally, but all failed. Boyd was even threatened with a court martial because he had “stolen” computer time with his unauthorised project. Throughout Boyd’s career he hadn’t played political games, had always called a “spade a spade” and hadn’t suffered fools. The result was he had many enemies who were wanting payback. What it meant was he would never achieve the rank of general officer as he was seen to be just too outspoken and told the plain truth. But a crisis in Vietnam with U.S. planes being shot down meant Boyd was needed in assisting in the planning for the next fighter aircraft, called the F-X. In mid-1966, Major Boyd was assigned to Air Force headquarters in Washington, D.C. where he would remain as military officer and later as a civilian for the next 23 years. The F-X program for a new fighter was destined to be another disaster until Boyd came along. Although he was only one of hundreds of individuals involved in designing the aircraft, Boyd’s E-M Theory was fundamental to the eventual product – the F-15 fighter. But by the time all the various committees had they say, the cost had blown out to $30 million per aircraft. It first flew in 1972 and went into service in 1975, the year Boyd resigned from the Air Force. The F-15 has proved to be one of the most successful modern-era fighters, with over 100 aerial combat victories and zero losses. Still in production until 2019, some 850 units have been built over the last 45 years for the U.S. Air Force and for other countries. Boyd and his followers still believed there was scope for a smaller, lighter and less costly fighter aircraft. Boyd and his like-minded colleagues formed the “Fighter Mafia” to promote their ideas in the Pentagon. Despite reluctance by the Air Force chiefs, David Packard, the Under Secretary of Defense in the Nixon Administration was sold on the idea. In 1972 the U.S. Department of Defense issued contracts to General Dynamics (now Lockheed Martin) and to Northrop for each contractor to design, build and test two prototypes as part of a competitive bid. One design would then be selected for full production as the new light-weight fighter aircraft for the Air Force. Even though Northrop had several years start in developing similar prototypes, the General Dynamics YF-16 first test flight was in February 1974, months ahead of the two YF-17s from Northrop. In January 1975, it was announced that the General Dynamics F-16 would be the Air Combat Fighter (ACF) for the U.S. Air Force. The production version of the YF-16, called the F-16 “Viper” or alternatively the “Fighting Falcon”, performed brilliantly and although Northrop lost the Air Force contract, they were successful in developing their prototype to become the F/A-18 “Hornet” used today by the U.S. Navy and by other countries. Over 40 years later, the F-16 is still in production although with advances in technology are totally different from the early versions. Over 4,500 aircraft have now been supplied to 26 countries including the U.S., Israel, Egypt, the Netherlands, Denmark and Norway. In 1973 Boyd turned his attention to studying a multitude of subjects beyond aircraft design, including science, philosophy and the humanities. The end result was a short paper, Destruction and Creation, published in 1976. He was now setting about tackling some fundamental questions about how our minds relate to external reality. In the meantime Boyd had been promoted to Colonel in 1974, the last promotion he would receive. On August 31, 1975 he retired from the Air Force but was asked to stay on as a consultant to the Office of the Secretary of Defense. He didn’t want to be paid but was forced to accept one day’s pay per pay period. Over the 15 years between 1977 and 1992, Boyd continued to expand his insights into a general theory of competition and conflict. These studies were presented as detailed briefings and not in a written form. Some of his greatest work took place during this period, including the development of the OODA Loop. Observe and Act involves inputs from and outputs to the external world of reality. Orient and Decide are internal to the decision maker and are involved in dealing with the perception of reality. Observe the adversary with on-board sensors (especially the pilot’s own vision). Orient himself by predicting the course of maneuvers by the enemy based upon an assessment of the enemy’s energy state, knowledge of the enemy’s tactics, aircraft, and relative advantage in position. Decide on the maneuver needed for himself in order to defeat an adversary’s attack or counter an adversary’s defensive move while on the offensive. Act by accomplishing the maneuver with great speed, which is designed to be unpredictable and asymmetrical. The outcome from such maneuvers is a disruption from the flight path that would normally be expected, resulting in confusion of the enemy. The cycle is then repeated. If a series of maneuvers can be accomplished with such speed that the adversary cannot react with appropriate counter-maneuvers, then victory is certain. The key for many followers of Boyd the need for the cycle time to be shorter than the opponent’s. In a military context, there are two tactics involved: one is to slow down the enemy’s OODA Loop decision processing while the other is to speed up one’s own OODA Loop processing. What the OODA Loop means for business is that if you can perform this sequence faster than your competitor in making yourself more attractive to your customer, you will achieve a competitive advantage. A famous example is the Honda-Yamaha “war” which been well documented by George Stalk and Thomas Hout in their book Competing Against Time. When Honda heard that Yamaha were planning to build a large factory facility to build motorcycles they didn’t respond by building another factory. Instead they concentrated on improving their business processes and were able to release a flood of new models at a much faster rate than Yamaha could achieve. The customers loved it and Honda ended up in being the clear winner. Such an outcome is called disruption marketing. This is a common way of describing the OODA Loop. But it’s not the full story. 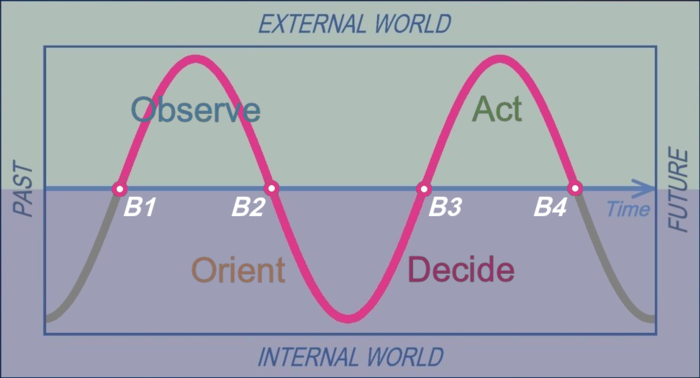 In Boyd’s two-day briefing of Patterns of Conflict in September 1986 he discussed what he called Observe-Orient-Decide-Act, or the OODA Loop, in some detail for the first time. The core function of the Orient phase is Analysis and Synthesis coming from the Observe phase and feedback from the Decide and Act phases. But Orient also refers the state of mind of the individual in understanding the external reality. 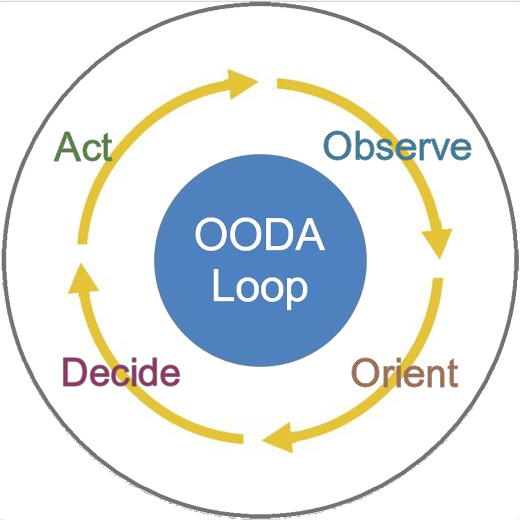 The OODA Loop can be redrawn in the time domain. The white dots in the Time domain display represent the bottlenecks that occur at the transitions between the external world – the true reality – and the internal world – the perceived reality of the subject. The bottlenecks are in the mind of the beholder and occur when the subject is confused by unexpected events or distorted information in the external world. It’s the role of the “good guy” to create events and distort information in order to confuse the opponent. The “good guy” also needs to eliminate bottlenecks to his own thinking – usually through practise and simulated exercises repeated over and over again until actions as a result of particular patterns of observations are intuitive. B1. Initiation bottlenecks occur when the purpose is unclear or unknown. Boyd was very clear about his purpose. In air combat his purpose was to get inside the OODA Loop of his opponent. B2. Depiction bottlenecks occur when there is a breakdown or distortion in the translation of external events, announcements, stories, threats, opinions, and intentions of others into our depictions of what is really happening external to us. Some of the common depiction bottlenecks are not allowing a variety of views and inputs, arrogance and prejudging (i.e. prejudice, and simply ignoring unpleasant news. To minimise depiction bottlenecks Boyd was adamant that combat pilots have 360 degree view of the situation and hence we see the large canopy fitted to the F-15, F-16 and F/A-18 aircraft. B3. Enactment bottlenecks occur when there is a breakdown or distortion in the transition from our internal world of intentions into actions in the external world. Some examples of enactment bottlenecks are ego and false logic, indecision, fear, procrastination and physical limitations. Boyd recognised one of the key advantages of the Sabre jet fighter was its superior manouvrability due to the hydraulically assisted controls making it easier for the U.S. pilots to achieve fast transients. Boyd spent something like 10 years reviewing the performance of the U.S. in Korea before finally understanding the reasons for the superior results. To fully appreciate the Orient phase requires a view of the Relationship Domain. If we took a slice at right-angles to the Time Domain we arrive at the Relationship Domain. In other words in this domain we’re looking at history from the start of time to today. (The Time axis comes out of the page towards you.) From this it’s easy to see how Orient maps into the I Can and We Can quadrants. Cultural traditions, genetic heritage, new information, and previous experience all shape analyses and synthesis followed by action in the I Do quadrant. Technology and organisation are also involved in the systems or We Do quadrant. In the years leading up to his death in 1997 Boyd continued to make contributions to the understanding of military strategy and business strategy. Even though he did not publish his ideas in a book many of his followers and admirers have ensured his name and his ideas are not forgotten. 1. John Boyd, “Air Combat Maneuvering,” Fighter Weapons Newsletter, no. 2 (1957): 3-31. http://oplaunch.com/resources/air-combat-maneuvering.pdf. 2. Robert Coram, Boyd: The Fighter Pilot Who Changed the Art of War, (Boston: Little Brown, 2002), 21. 4. John R. Boyd, Aerial Attack Study, revision of 1960 research report prepared for USAF Fighter Weapons School, (Nellis Air Force Base NV, 1964). http://oplaunch.com/resources/aerial-attack-study-1964.pdf. 6. John R. Boyd, Destruction and Creation, unpublished essay, (1976). http://www.goalsys.com/books/documents/DESTRUCTION_AND_CREATION.pdf. 7. George Stalk and Thomas Hout, Competing Against Time: How Time-based Competition is Reshaping Global Markets, (New York: The Free Press, 1990). 8. John R. Boyd, Patterns of Conflict, unpublished briefing slides, (1986) http://www.dnipogo.org/boyd/pdf/poc.pdf. 9. John R. Boyd, The Essence of Winning and Losing, unpublished briefing slides, (1996). http://pogoarchives.org/m/dni/john_boyd_compendium/essence_of_winning_losing.pdf. 10. Gary Klein, Sources of Power: How People Make Decisions, (Cambridge, Ma. : The MIT Press, 1999). 11. Gary Klein, The Power of Intuition: How to User Your Gut Feelings to Make Better Decisions at Work, (New York: Currency Books, 2003). Coram, Robert. Boyd: The Fighter Pilot Who Changed the Art of War. Boston: Little Brown, 2002. Ford, Daniel. A Vision So Noble: John Boyd and America’s War on Terror. Durham, NH: Warbird Books, 2010. Hammond, Grant T. The Mind of War: John Boyd and American Security. Washington, D.C.: Smithsonian Institute, 2001. Osinga, Frans P.B. Science, Strategy and War: The Strategic History of John Boyd. London: Routledge, 2007. Richards, Chet. Certain to Win: The Strategy of John Boyd Applied to Business. Bloomington, IN: Xlibris Publishing Company, 2004. 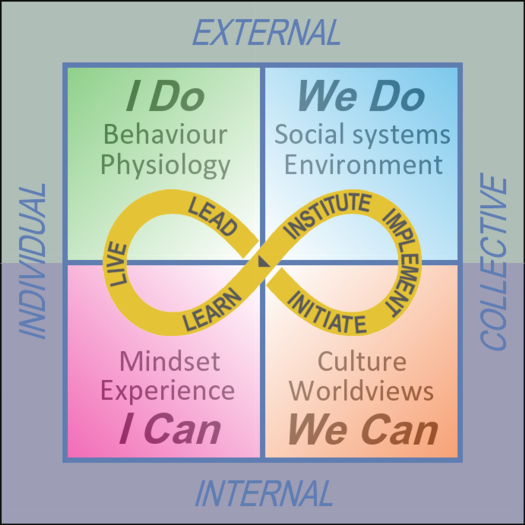 Posted in can-do wisdom, Change, Decision making, Leadership and tagged change instigator, decision making, F-16 Fighting Falcon, John Boyd, leadership, OODA Loop.